The latest update from trustee Russell Ball on his Lands End to John O’Groats profile- and fund-raising ride. On the eve of Ride4Research ride day (8th Sept.) I found myself at the Lands End sign-post feeling nervy and very unsure. Firstly, would my knee strain picked-up in training stand-up to the 1,000 mile plus ride and secondly, how could I know what awaited me on this infamous of bike trails? The latter was brought into focus the following morning seeing the pairs/groups of riders many with support teams: this was going to be a solo unsupported ride for me. I cracked on with tree (bird cherry)-laden bike and the first school just around the corner. I’d had some earlier cheer, however, at the B&B with my first John O’Groats direction: “go down to the duck pond and turn left”. 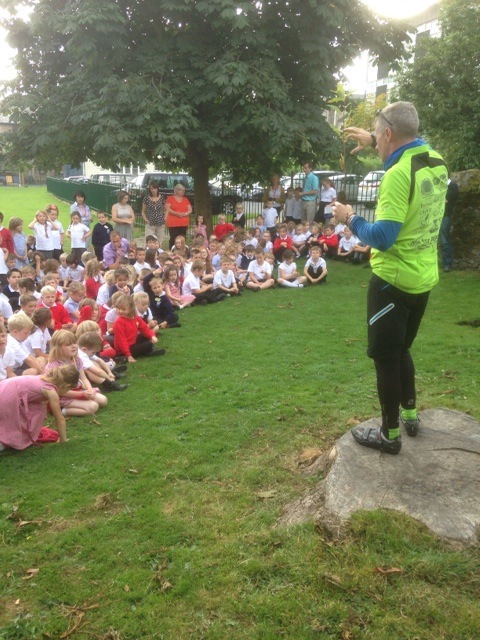 The St Levan school pupils were very attentive during the outdoor classroom on tree benefits and with cheers to send me on my way I set off on day one. In End2End circles Cornwall and Devon are renowned as a challenging hilly bike ride. I wasn’t to be disappointed. Sap draining gear grinding miles were cranked out mitigated, however, by beautiful rugged (though tree-less) coastal landscapes. Arriving in Camelford I was relieved that the legs felt good and the knee was fine. The Camelford school turn-out was impressive and the pupils were intrigued by my iron horse. The route through these counties was a mix of country lanes punctuated with busy stretches of the A30 and lorries bombing past some far too close for comfort. Once up on Bodmin Moor the road thankfully flatten though a headwind fought me all the way to Exeter where I met up with Kenton Roger (I-tree fame). After a few beers in Kenton’s local pub and a fine home cooked spag. bol. it was a early night for the next tree planting at South Brook School. The pace of the classroom session was geared down in this special needs school and I was touched that one pupil thought spuds grew on trees. The next leg led to Glastonbury then up the Mendip Hills: a slow but pleasant grind with great views of the iconic Glastonbury Torr. A pattern of 8-10 hours in the saddle with breaks and a sustainable pace of between 12-15 miles per hour was emerging. At destination Exeter I met with David Evans (QTRA fame) for a well-earned beer. Over the two night stop-over David cooked up some gastronomic dishes. Of all the schools in Bath I’d chosen one on the ridge that surrounds the city: involving a steep sharp climb. On arrival at Combedown School I was ushered into a pupil-packed assembly feeling a bit of a sweaty mess. After an engaging full-on tree benefits assembly it was outside to plant the tree with the echo-club. The Tour of Britain was in town so a break was had to stand on a tight hillside bend to see proper cyclist in action: alas with Sir Bradley Wiggins in last place! With three days complete it was time to catch the train from Bath to Egham to lead the one-day Ride4Research event (at the AA conference) through Chobham Common and Windsor Great Park (WGP). This time John Deakin (Crown Estates Chief Forester for WGP) kindly put me up in his fine family forest lodge. The ride was a fun social event as ever – punctuated with stops to plug into John Deakin’s infinitive (royal) knowledge of WGP – topped with a fine AA hog-roast and an ancient tree management field day hosted by Bill Cathcart and Ted Green. The riders had a great time especially the post-ride beers at the Monkeys Forehead. On Mon. 15th Sept. I took the train back to Bath to recommence the ride: making my way along the busy A46 to Cheltenham. Yet another stop-over with Chris Chavasse (Senior Tree Officer: Cheltenham Council). A fine homemade curry and a few beers in a skittle playing pub saw off the end of the day. The newly built amphitheatre at Warden Hill School provided a perfect setting for an all school assembly tree talk. With all en route schools I was impressed with the green knowledge of the pupils and at least a few pupils in every case knew the autotrophic ‘P’ process: photosynthesis! A collective choral shout of grow-tree-grow saw the cherry duly planted. Cutting across country took me through the picturesque town of Ledbury and on to Bromyard: then destination Shrewsbury. Still feeling good on arrival I landed at the Whitehorse pub for a double everything grill and was pleased to hear that many End2Enders appear a little jaded when stopping at this pub. Not me. Next day (16th Sept.) Coleman Primary School were on form and a group photo-call with the iron horse proved a favourite. One pupil noted that the bike was ‘v. cool’. Back on the A49 I headed for Warrington, Wigan and then Preston (550 miles in). Must confess I had a brief body-aching this-is-tough moment but I figured such things had no room on the ride and rallied round to crack on. 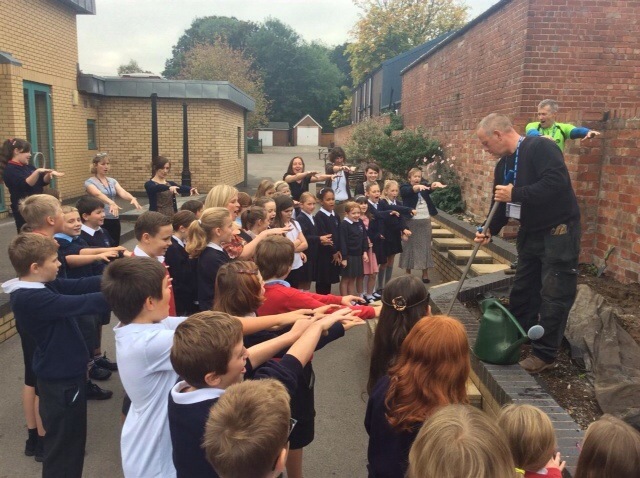 Although a tarmac clad school we found the planter for the tree at Eldon Primary watered with the cutest plastic watering can ever! The tree will be planted out at a later date on nearby school field. Day ten of the ride was excellent: a wind-assisted cycle from Preston to Penrith flying up the A6. A welcome stopover break again with fine food was had with Rob Sim (Capita) and we planted two trees (another cherry kindly supplied by Capita) at Stramongate Primary School (Kendall) with site prep from Graham Nicholson (Capita).There was brief shock horror moment with the pupils moving from one tree to another that denigrated into a 420 pupil stampede! No worries only some slight bruising! So 660 miles into the ride here I am in Gretna Green having made the Scottish border (knock-out). It’s now over halfway, feeling strong and mental on-it. But there’s still around 500 miles to go until the John O’Groats tikka-tape. Reflecting back the schools have been great and the pupils even better. Physically and mentally this had been one of my toughest challenges from self-doubt in Cornwall to flying into Penrith on a tailwind. I’ve been knocked by all the stopover hospitality: a true testament of the empathy of arborists 🙂 The iron horse, trees and me are set to crack on up into Scotland: more news soon.